I have read a number of books in the Quilts of Love series, and all have been light, pleasant reads. A Stitch in Crime by Cathy Elliott is the latest. Clearly, from the title, this one is a mystery. I read this while traveling, and it was a very nice diversion. Elliott drew me in pretty quickly. Thea was pretty likable, with a best friend who is now being snarky and rude to her, a guy she is interested in, and she is a bit over her head as co-chair of the quilt show. Boy, could I ever relate to that. Somehow, I seem to find myself in positions that I feel completely unqualified to tackle. Of course, Thea's situation involves things like crime scene tape. I can't say I tend to get that over my head. This is not my favorite Quilts of Love title, but the story kept me guessing. 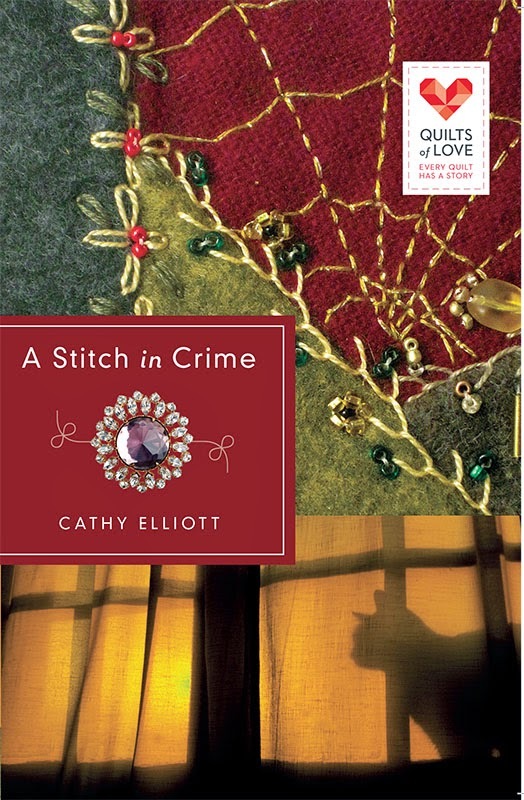 Don’t miss the newest Quilts of Love book, A Stitch in Crime by Cathy Elliott. Thea's first quilt show begins to fall apart at the seams. Will she be able to piece the mystery together and save the town’s investment in the quilt show before another attack happens . . . with far worse results. P.s. I have a giveaway on my blog!